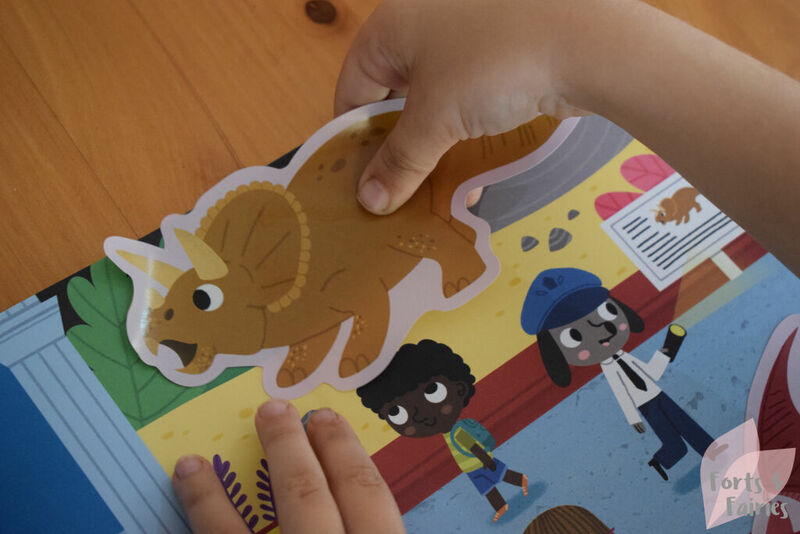 My children have always had fun with stickers, it’s for this reason that I always have a small stash in my cupboard – perfect for rainy days, car trips, visits to friend’s houses, entertainment at a restaurant, or even last minute gifts. 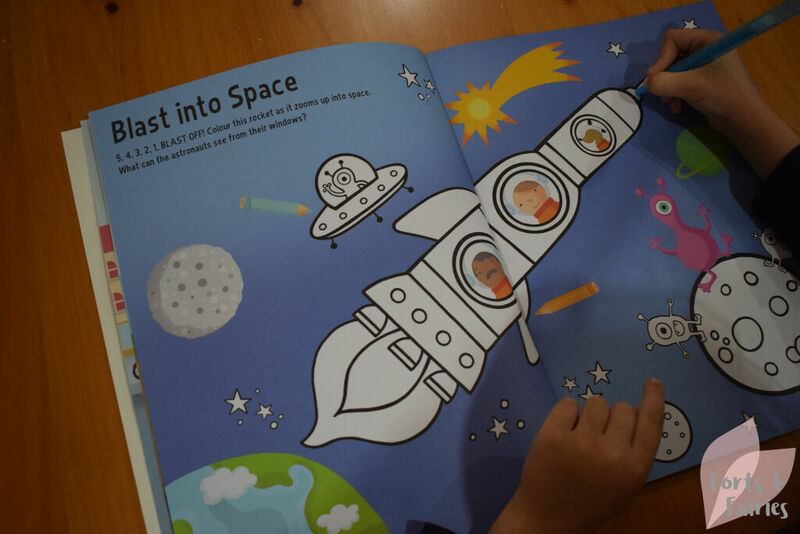 My children, who never stop crafting, love using stickers to create their own art, so they were absolutely thrilled when these beautiful sticker books arrived from Pan Macmillan. 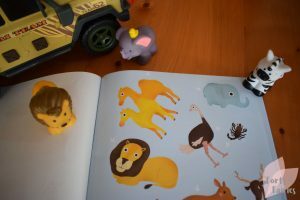 The Big Stickers for Tiny Hands books from Pat-a-Cake are available in a variety of themes, so you can spoil that special little someone who just loves cars, trucks, diggers, or basically anything on wheels with Things that Go, or head out on safari to meet his favourite giraffes and lions in Wild Animals, or even explore the great outdoors in Out and About. 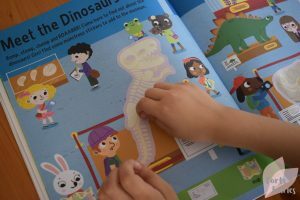 The books are big, and this makes it easy to place the stickers on each page. As the name of the title suggests the stickers are also big, making it easy for little ones to peel them off. 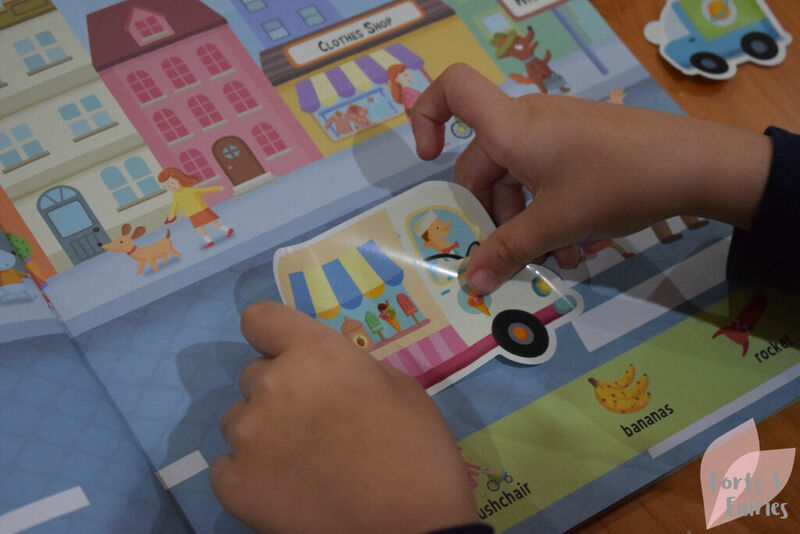 The stickers are also marked with special arrows showing you the easiest way to peel them off, making this a frustration free sticker time. Each scene ties into the theme of that sticker book, with beautiful double-paged scenes that feature brightly coloured backgrounds upon which you can place the stickers. The scene directs you to add certain stickers to the background, and it also lists different objects and animals which your child will be able to search for, making it educational and fun at the same time! 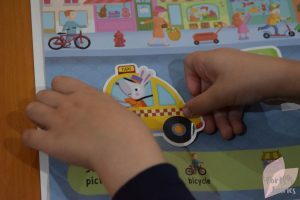 Let’s also not forget that stickers do help to develop fine motor skills too. Get ready to explore the world of animals with Wild Animals, from the Amazon to the Sahara Desert, before heading to Australia and even the wild mountains. This means there are a large variety of animals that your child will be learning about, and it gives you the opportunity to discuss the different environments too. There are also activities where you’ll need to spot the odd one out, maze and spotting games. There are even some colouring in pages with guides to help you use the correct colours should you choose to. 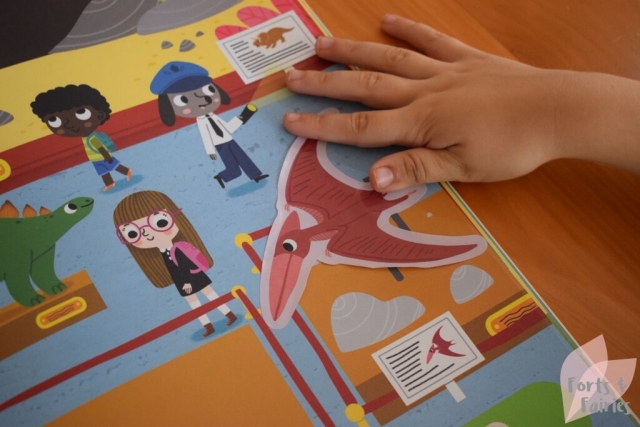 Your child will be thrilled to discover the giant fold-out picture, a beautiful scene that folds out both to the left and right to reveal an enormous under the sea background which you can then decorate with the sea creature stickers. 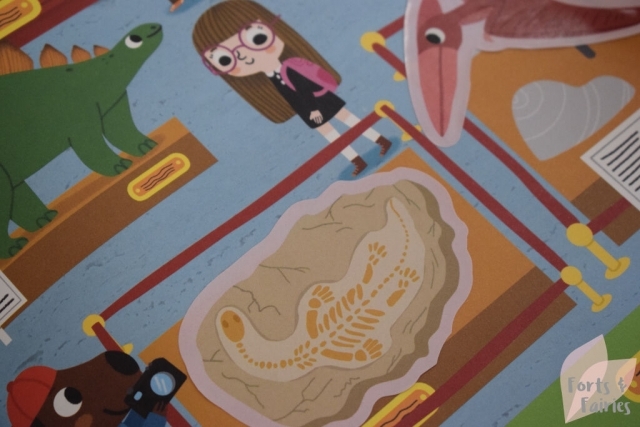 The Out and About sticker book will see you stopping by a busy park, participating in a woodland race and even meeting dinosaurs in a museum. 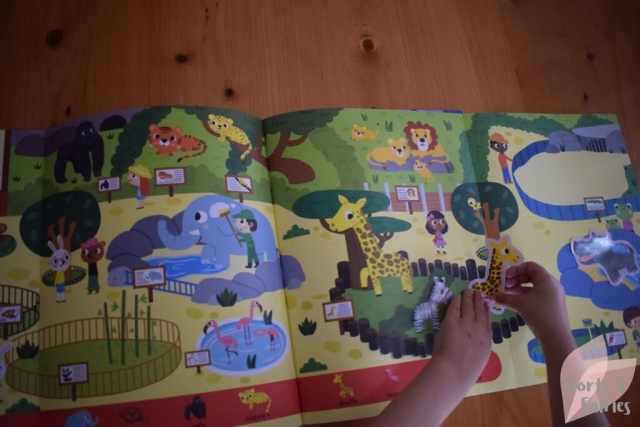 The giant fold-out scene is a day at the zoo, with the activity pages including spot the difference, matching and spotting games, and even a checklist of what fun days out you have enjoyed. 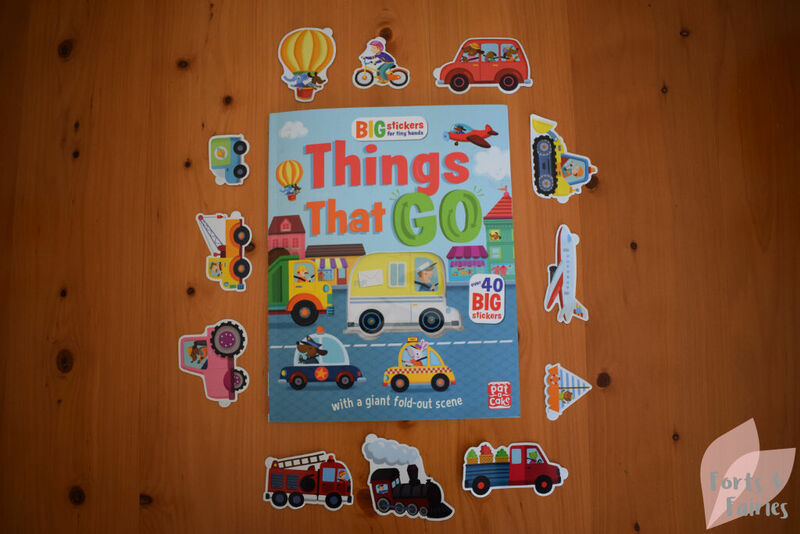 Things that Go still features the big stickers, unlike the other two books they are ready-cut but this still makes them easy to peel and stick. You’ll be able to decorate a busy street in town, add the right vehicles for the job on a construction site and check in at the airport by adding the colourful stickers. You’ll also be able to colour in a rocket as it blasts into space and complete other activities including a maze, odd one out and join the dot. The giant fold-out scene is a fun picture featuring train tracks and roads that wind their way through the city and countryside. 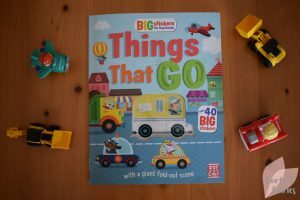 With over 40 big stickers in each book as well as beautiful scenes to decorate, a giant fold-out scene as well as fun activities, the Big Stickers for Tiny Hands sticker books get a thumbs-up from this mom. 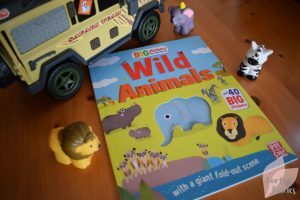 The books are brightly coloured, educational and I love the awesome cut-out on the front cover to show off the big sticker. Big Stickers for Tiny Hands are available at bookstores and online retailers for a recommended retail price of R140 each. 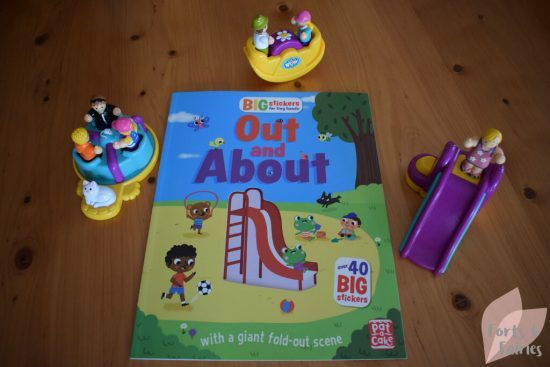 Thanks to Pan Macmillan for keeping our little hands busy with these big stickers.